Photographer Jonathan Mannon is one of the most significant photographers working in Hip Hop. From iconic album covers for Jay-Z and DMX to shots of Biggie and Rakim, Mannion has captured some of the most important moments in Hip Hop. Here, creative director Va$htie (Joey Badda$$) talks to the New York based photographer for Frank151 about working with the greats and remaining relevant. Check the video above and here's some thoughts from Mannion when G-Shock caught up with him a little while ago. "I did seven covers for Jay, up to the Black Album . I have one million per cent love for Jay-Z. Our careers have run parallel. Our relationship has been career defining for me. We made what these images were, we created what they feel like and it's like DJ Quik said, 'The world sees hip-hop through your eyes'. There's a lot of people contributing but some of the significant, defining moments people can see 'Oh what, DMX in the blood? That was you?' and I want those defining photos. One of my standout memories is shooting Jay-Z’s Reasonable Doubt album in 1996. I turned up that day with three pages of notes and I was like 'Look, here's what I wanna do…' He had the whole Versace, speedboats, Biggie video thing going on and I didn't want that. I suggested we had to go Mafia, John Gotti, surveillance, sharp suits, swag… he was like 'I'm with it, let's go.' 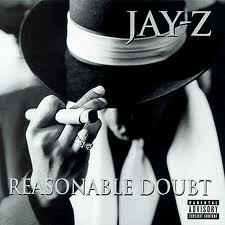 And so began the creation of 'Reasonable Doubt' - that was shot on the roof of my building, by the West Side Highway." 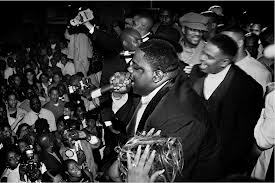 "I'm grateful to have photos of Biggie, Jam Master J, Left Eye, Aaliyah… I worked with Biggie a handful of times. One time was at the Palladium party when he received his award for Ready To Die going platinum. Jay-Z was in the room, Busta Rhymes was there, Junior Mafia... I somehow weaselled my way onto the stage. I captured one of my most important pictures then because the vibe of that picture really is what that moment felt like." "My three essentials for a shoot are: firstly an amazing assistant. I really need someone that can make everything move fluidly? Second, always have at least one camera loaded and available at any time. Lastly, I try get a good night's sleep too, but that's not always possible… [laughs]. I keep with me a positive attitude - the same dedication, the same attributes I've always thought make a good photographer. I don't take for granted that there's a hundred people right on my heels. People wanna do what I'm doing - they want my throne [laughs]." See more of Jonathan's work here.